One way to increase the interest within an eighth-note line is by varying attack and volume. This is done to achieve a more vocal quality in your playing. A quick perusal (better yet, a long perusal) of any Charlie Parker solo, for example, will give you an idea of the rise and fall of attack and volume that happens within a well-conceived line. You will quickly realize that Bird’s phrases don’t consist of a stream of endless eighth notes played with no articulation. 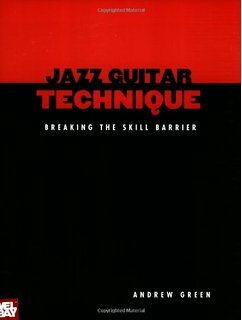 • Hammering (“H”) — After first picking a note, playing a higher note by fretting it without picking again. • Sliding (“Sl”) — Playing a note one fret below the desired note and moving up to it using the same finger. This happens faster than a slur or hammer, so that the effect is of one attack not two. • Pull off (“P”) — Picking the first note then playing a lower note by pulling the string with the finger that fretted the first note. • Accenting (“>”) — Picking some notes harder, therefore louder, than others. The general idea is to pick on the upbeats and either hammer/slur or pull off on the downbeats. The notes that aren’t picked will be slightly softer, allowing for variation from note to note within a line. Add to this the concept of varying the accents on the notes you do pick, and you have gone a long way toward achieving a more swinging, less monotonous sound. Notice that within the phrase, not only were some notes louder than others, the varying of attack yields a more vocal quality overall. The following is a sample of the Phrasing studies in the book.